The plugins discussed in this section comprise a typical CBOX Classic installation. Some are required, others are recommended. 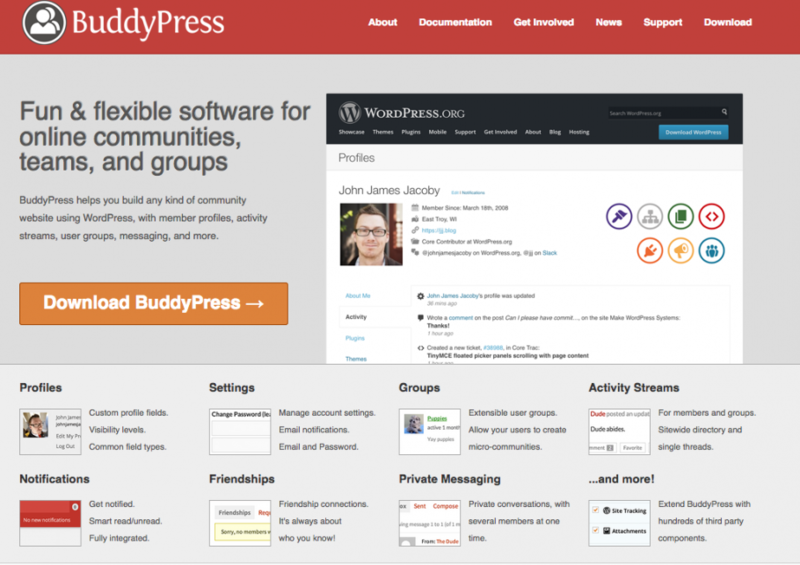 BuddyPress is a social networking platform for WordPress, enabling a community to connect using profiles, groups, and more. BuddyPress’s features form the core functionality of CBOX Classic and surfaces community activity. Support: BuddyPress has its own Site and Codex at Buddypress.org. 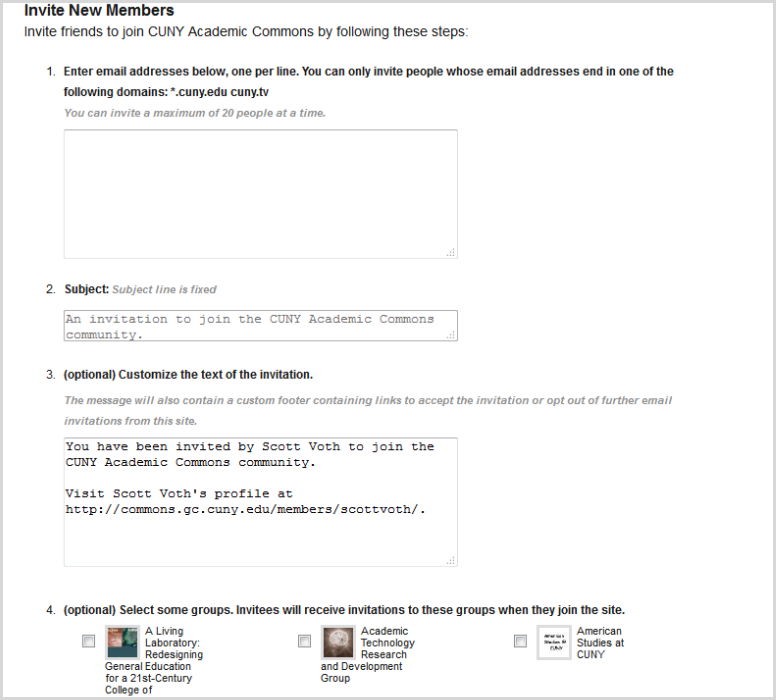 The bbPress plugin adds discussion forum functionality to groups. On a CBOX Classic group, bbPress creates the Discussion section of a group’s home page, allowing members of the group to start discussion topics, create discussion threads, tag content, and easily add images and links. Documentation: See the bbPress plugin page. Authors: Developed by John James Jacoby, WordPress founder Matt Mullenweg, and many others. Support: See the plugin’s own support site. “Part wiki, part document editing,” BuddyPress Docs creates a space for members to create collaboratively edited documents on any group home page. 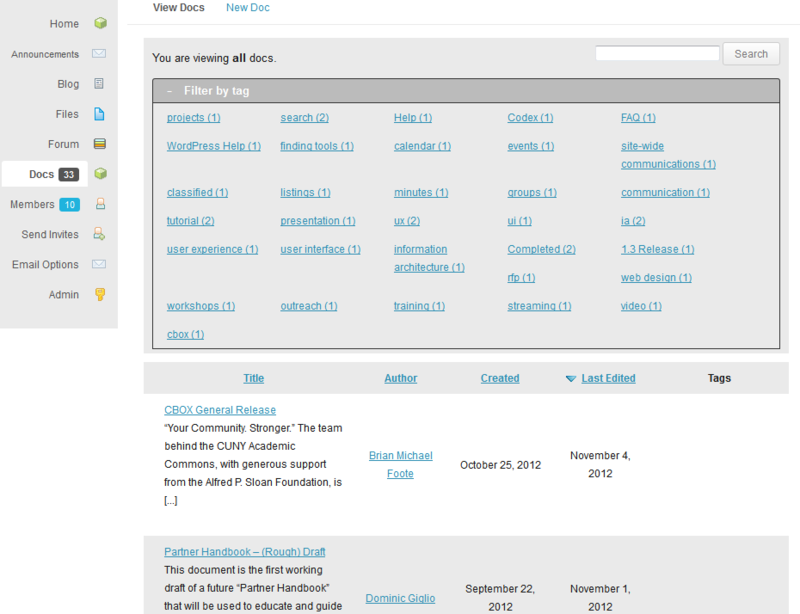 Version control is automatically maintained, and members can revert changes, or simply track a document’s evolution. Permissions can also be set to control editing and viewing privileges, and documents can be tagged, sorted, and filtered. Documentation: See plugin page. 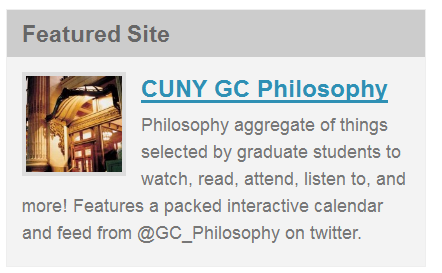 For more information, see the post on the CUNY Academic Commons Codex. 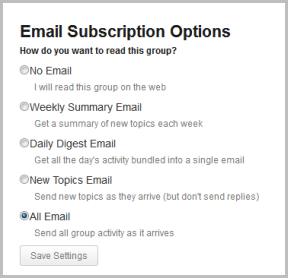 The Group Email Subscription plugin notifies members of a group via email when other members post content. Admins can configure the content of each type of email, and members of the community can choose the frequency of notifications for each group: (1) No Email; (2) Weekly Digest Summary; (3) Daily Digest Summary; (4) New Topics Email; or (5) All Email. 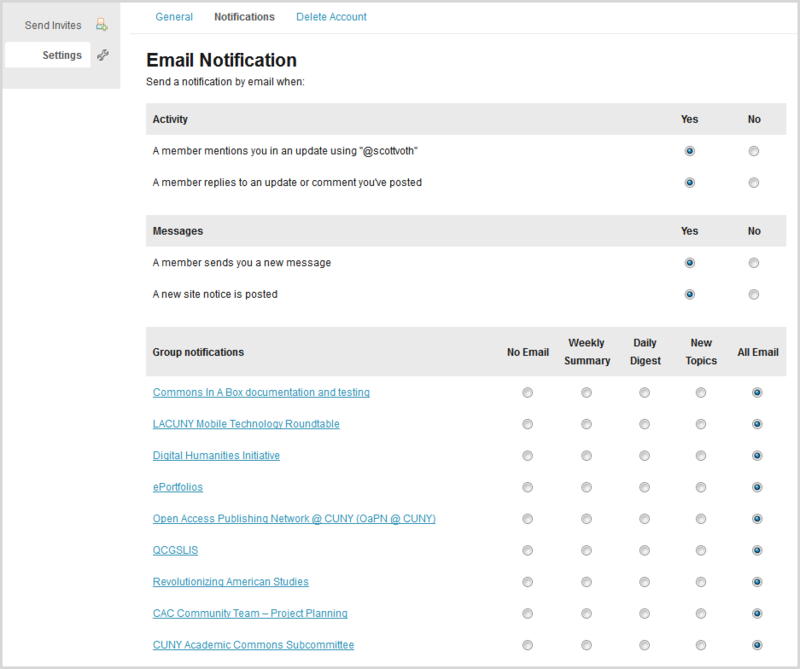 Members can also determine what kind of group activity that want to be notified about. Documentation: See plugin page and further documentation on the Commons Codex. 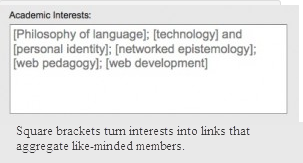 Authors: Developed by shambhalanetwork.org, the CUNY Academic Commons, and bluemandala.com. Support: Support for this plugin can be found here. The Invite Anyone plugin allows group admins to send out email invitations to join their group, and allows community members to invite others to join the community. Documentation: Available at Invite Anyone plugin page. Authors: Developed by Boone Gorges in conjunction with the CUNY Academic Commons. Support: Plugin support can be found on the plugin page. The Featured Content Widget plugin is a convenient tool that can be used to feature site content: blogs, groups, individual posts, members, or resources. It is BuddyPress dependent, and will not work on non-BuddyPress installs. Since it is a widget, you will need a widgetized area to put it in – the default CBOX theme automatically places it on the home page, to the right of the slider, but this is totally configurable. Featured Content Widget is a recommended plugin, and can be de-selected if you choose. Authors: Developed by Boone Gorges and Dom Giglio, in conjunction with the CUNY Academic Commons. Support: Support for the plugin can be found here. 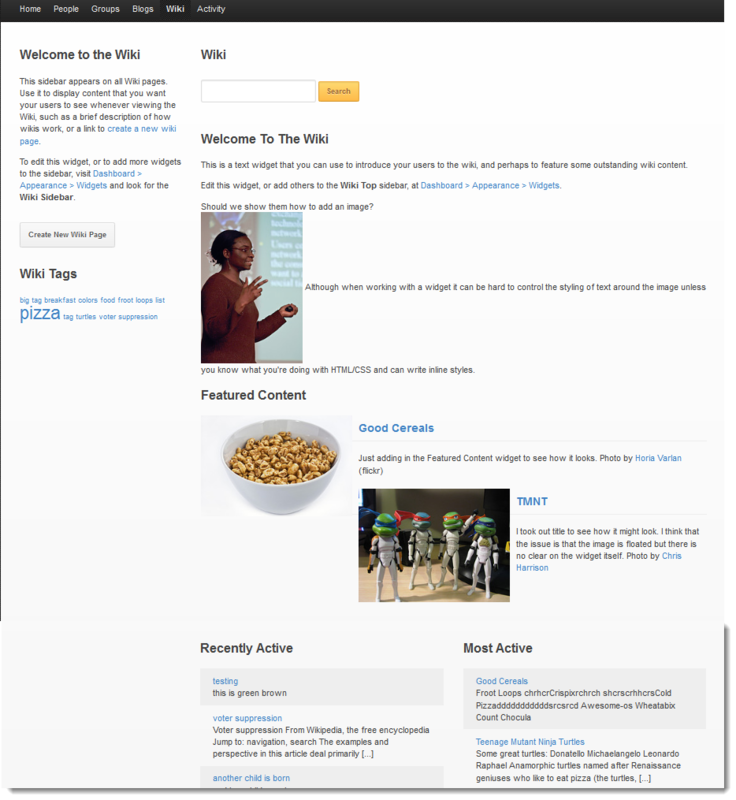 BuddyPress Docs Wiki lets members create a sitewide wiki and collaboratively build a knowledge repository. Documents can be tagged, categorized, and grouped hierarchically. Revision tracking makes it easy to go back to past versions. For more information, see CBOX Classic Sitewide Wiki. The Custom Profile Filters plugin enhances a BuddyPress member’s Profile Page. 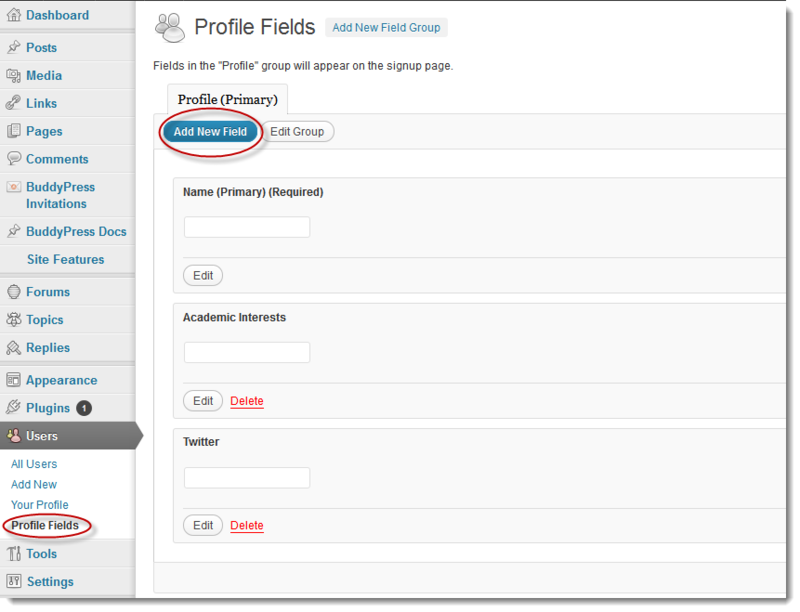 The plugin automatically converts some fields in a user profile into links, and aggregates group interests into groups to let members with similar interests find each other. Documentation: See the plugin’s page. 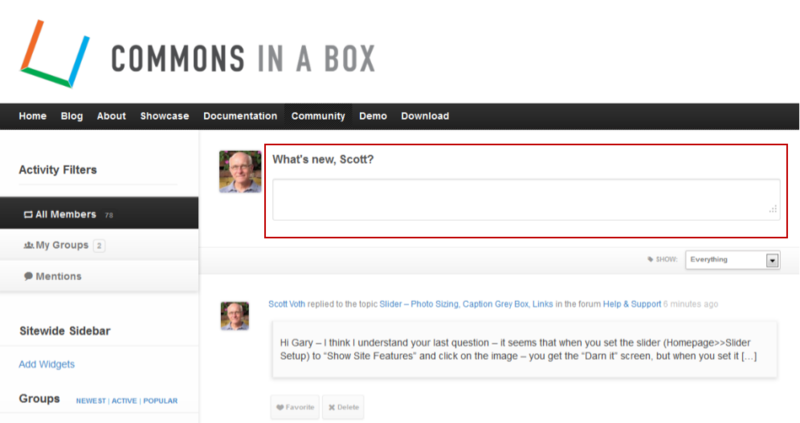 The Group Announcements plugin removes the BuddyPress default “What’s New” announcement textbox (see screenshot, below) from a group main page, and makes it available instead on a new Announcements tab on the group’s sidebar. 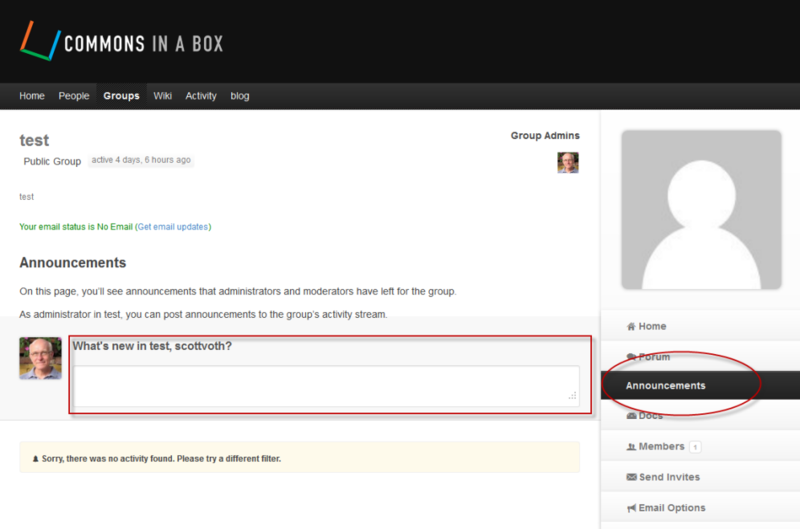 The functionality is identical – announcements that a member posts go directly into the group’s activity stream. The plugin addresses the confusion members face when posting to the forum, and accidentally posting an announcement, and clarifies how new discussion threads should be initiated. Documentation: Available at its plugin page on GitHub. Authors: Developed by Boone Gorges and Ray Hoh in conjunction with the CUNY Academic Commons. Support: Plugin support can be found here.